Edited by L4wlight, 20 September 2018 - 03:26 AM. Hunter's Claw - (2 Bond) Full Attack, The first target hit with this grants +1 Accuracy vs the target's Race until Rest. Subsequent hits against the same race will increase stacks (up to +20). 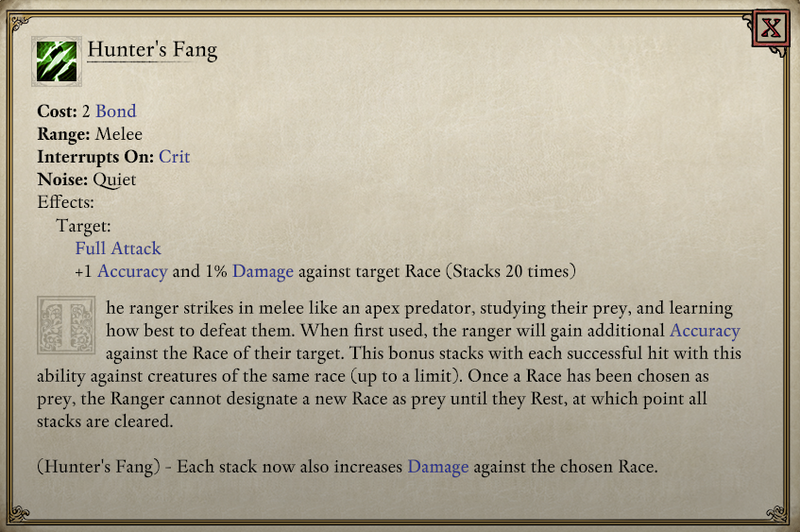 Resting clears all stacks and allows a different race to be chosen. Am I the only one concerned about this ? This feels like some kind of band-aid really, trying to pump up Ranger damage while also giving them some "nice" abilities. Thing is, these will feel mandatory in the game, and what do all mandatory things do ? They get boring, is what they do. Besides, they hardly add to mechanics and tactics do they ? Really, these new... abilities... just do not work for me. It looks like the Vela bug has been re-introduced with this beta patch. She's stopped appearing for me with an imported save. Edit: Actually she appears on the ship but not on the beach strangely enough. Edited by nostalchic, 20 September 2018 - 03:24 AM. I think melee refers to both ranged and hand to hand? And to add extra stacking damage do you have to keep using this ability or can you just autoattack? Edited by Teclis23, 20 September 2018 - 03:48 AM. No. It does not work with ranged weapons like most fighter- and some monk abilities. Although you could maybe maximize its effects with an aoe melee weapon? Edit: Silly me.... Forgot that resources regenerate between encounters. So you actually only need multiple enemy groups. Still, that means that it's not as awesome, as it takes several encounters to maximize stacks... and you may not encounter that many of one race. Edited by Haplok, 20 September 2018 - 05:30 AM. Does that fix crew's money "eating" bug? The one where money randomly disappears? So you have to keep using this talent to add stacks? You cant add stacks with just normal attacks? Edited by Teclis23, 20 September 2018 - 05:24 AM. Its official. Hunters claw (and fang) are 100% the most stupid and underwhelming talents that have been introduced into the game. Just gob smacked at the stupidity of introducing something as crappy and underpowered as this. Edited by Teclis23, 20 September 2018 - 05:59 AM. They claimed that this was fixed in 2.5, but I haven't checked. Hm.. so it costs 2 Bond to apply 1 stack... and you need 2 Bond for each following stack? Does it happen only to me, or is the Guardian of Ukaizo fight still bugged? I have just checked with one of my old saves, and the guardian still does not appear or does not even say anything; although I am attacked by Engwithan titans (before the patch, this was not happening). Anyone having similar problem? That's too much qualities, kinda devalues the idea imo. You won't have many Mythic items, so they will feel rare and special. Edited by InsaneCommander, 20 September 2018 - 07:50 AM. There'll presumably be one per megaboss for a total of 5, plus one from Berath's Blessings and any the paid DLC might include. Does mean soulbounds will lag, maybe each soulbound could start a quality level above what it does now to even it out. Or maybe add another level of progression for them all? I sure hope future mega bosses will have different drops from ingredients to enchant to Mythic quality. That would really cheapen Mythic items which, by the way, won’t be all that useful once no more mega bosses are left to fight. Rest of the enemies can be dealt with using Superb or Legendary gear. I do think soulbound items should upgrade to Legendary though. Edited by AndreaColombo, 20 September 2018 - 08:21 AM. This abilities is just useless since it's will clears all stacks when resting. So, has anybody tried the Kill Camera feature yet?